This project includes the recipe and complete instructions for making gorgeous cold porcelain roses. You can also purchase premade cold porcelain, but it is fun and easy to make at home with easy to find ingredients. Then follow dozens of step by step photos and learn to make exquisite shaded roses, leaves and buds. These are then applied to a lovely pale yellow silk bonnet. 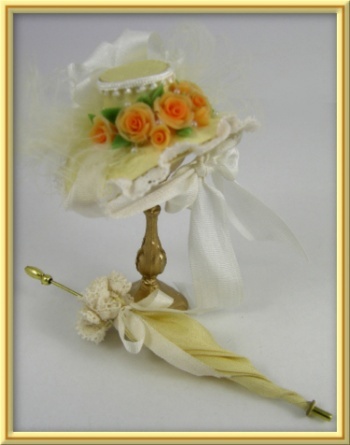 A matching silk parasol is also part of the ensemble.